What do you do for physical education? I mean nine year old boys, they run all the time. They don’t really have a slow speed. Everything they do is fast and faster. So do they really need a time that is set aside for physical education? I don’t think they do. My son plays soccer three times a week. He plays on a city league that has a game and a practice every week. He also plays on a homeschool soccer league. In the city league he gets to learn the rules of soccer. He learns what it means to play competitively. But in the homeschool league he learns to play as a team. He learns what it means to help the other kids that you are playing with. He learns sportsmanship. To me that is so much more important than learning the rules of soccer. 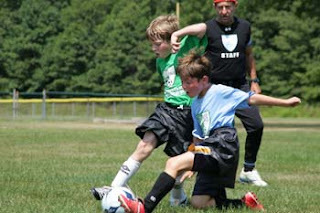 For us, soccer is what we write down as our health games and physical education class. But I think he also gets physical education during the afternoon after soccer when he is hanging out with his friends in the park. How Do You Handle Handwriting? How do you handle handwriting? I’ve been thinking about that a lot lately. I get asked a lot of questions about handwriting. But to be honest, I try not to think a lot about it. I bought a book called Handwriting Without Tears for my son. But to be honest, it should be called Handwriting With Lots and Lots of Tears. It is pure torture to get him to sit down and do anything in it. We have had it for three years now and he is still not even halfway through the book. Handwriting is just not something he is in to. Fortunately his main homeschool curriculum is on the computer so he doesn’t have to write much. We live in a world where more and more of our work is done on the computer. So there just isn’t the emphasis on handwriting that there used to be. I remember the hours of handwriting worksheets that I had to do as a child. If each letter wasn’t formed perfectly we had to do it all over again. It just isn’t that way any more. My son can write all the letters if he has to. Well, actually he can print all the letters. Is it really necessary for him to learn to write them in cursive? I’ve been trying to figure that out. I guess he does need to sign his name. I mean, as an adult, I have to sign my name all the time. I have to sign checks. I have to sign credit card receipts. I have to sign for packages from the UPS man. I to sign for prescriptions at the pharmacy. I know as my son grows up he will need to sign these things as well. So maybe he does need to write in cursive. At least he needs to learn to write his name. Oh man, I can just see the struggle starting. It’s too bad he can’t just carry around a handstamp with his signature on it. He would love something like that.